The Rectangle tool allows you to quickly draw a rectangle or a square. In the Tools toolbar, select the Rectangle tool. NOTE For tasks related to the Ellipse tool, see About the Rectangle, Ellipse and Line Tools. Just like other shape tools, this tool creates pencil lines. Hence, its tool properties are similar to the ones of the Pencil tool and it can be used with pencil presets. The Preview area lets you see a preview of the stroke your drawing tool will make. The arrow button right of the preview area opens the Pencil Properties dialog. 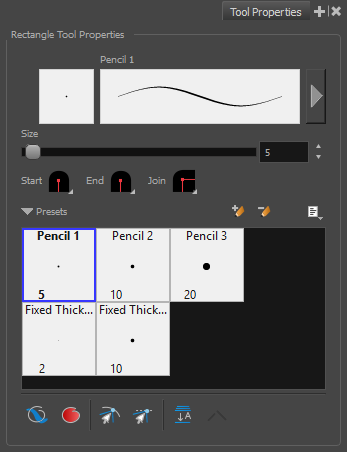 While the Tool Properties view only gives you access to a few of the pencil properties, a list of pencil presets and other drawing options, the Pencil Properties dialog gives you access to all the available options for your pencil's shape and texture. For more information on the Pencil Properties dialog, see the Pencil Properties Dialog section below. Defines the width of the pencil line used to draw the shape. You can adjust the start, end, and join style of a pencil line. These options affect the way your shape is added to your artwork. When enabled, your brush strokes will appear behind the existing artwork. NOTE Your brush stroke will temporarily appear over your artwork as you draw it, until you release the mouse cursor or tablet pen. If you want a live preview of your stroke, activate the Realistic Preview option by selecting View > Realistic Preview from the top menu. When enabled, the shape you draw is automatically filled with the selected colour. By default, drawing a shape only creates its outlines. When enabled, while you're drawing, the mouse cursor will snap to the nearby contours of the artwork in your drawing. When enabled, while you're drawing, the mouse cursor will automatically align to the rectangular bounding boxes of other strokes and shapes in your drawing. By default, when drawing on a vector layer, each new stroke is created as a separate drawing object, which can be edited independently from other parts of the artwork. When enabled, the Auto-Flatten option automatically merges strokes into existing artwork. Using the Select tool, you can use select and remove a segment of flattened pencil lines. Overlapping pencil lines drawn with the Auto-Flatten mode are essentially cut into segments by the overlap and can be treated as individual lines. These options allow you to select, create and manage pencil presets. Storyboard Pro provides a few pencil presets and also lets you create and save your own. It is a good idea to create and save pencils with precise sizes and parameters when you draw for efficiency and consistency. You can export the pencil presets that you have created and import those that others have created. This is a good way for you and project collaborators to keep a consistent look for the project. Creates a new preset based on the current tool properties. Deletes the currently selected preset. 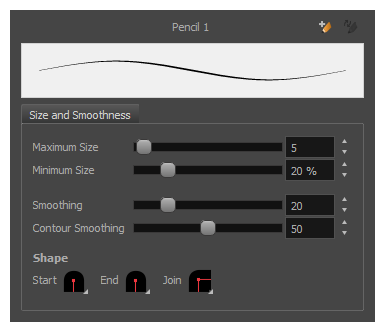 New Brush Preset: Creates a new preset based on the current tool properties. Delete Brush: Deletes the currently selected preset. Rename Brush: Allows you to rename the currently selected preset. Import Brushes: Allows you to import brush presets exported from Storyboard Pro. Export Brushes: Allows you to export your brush presets into an .xml file. Stroke View: Displays presets in a list, with their name and a preview of a stroke done with each preset. The Rectangle tool draws the same type of line as the Pencil tool. Hence, you can configure the Rectangle tool's lines using the Pencil Properties dialog, which you can open by clicking on the arrow button right of the stroke display area in the Tool Properties view. Maximum Size Defines the maximum size of the pencil line. If the tool is used with a pressure sensitive pen tablet, the width of the stroke will vary between its maximum size and minimum size depending on the amount of pressure used. If used with a mouse, the width of the stroke will always be its maximum size. Defines the minimum size of your stroke as a percentage of the maximum size. If you do not have pressure sensitivity from a pen table, the minimum size value will be ignored. Smoothing Defines the number of control points added to the centre line. The fewer the control points the smoother (but less faithful) the line. Contour Smoothing Defines the number of points on the contour share of your stroke. This will smooth out the bumps and waves on tour contour shape of your brush strokes.